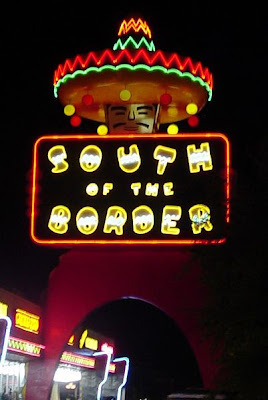 On the weekend I posted about South of the Border and the billboards on the highway we encountered driving back to Canada from Florida. 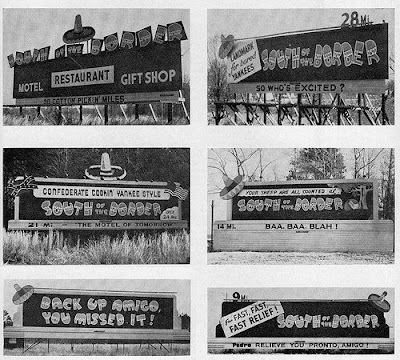 Located in Dillon, South Carolina, South of the Border started out almost 60 years ago as a beer stand. Over the years it steadily grew to become, you might say, the Kingdom of Kitsch. I didn't take pictures of all the billboards through South Carolina on I-95. But I have found some others, from over the years, on Google Pics. Enjoy! * Pedro's Weather Forecast: Chili today, hot tamale. * Keep America Green! Bring Money! * Pedro's fireworks! Does yours? Can you believe this place? 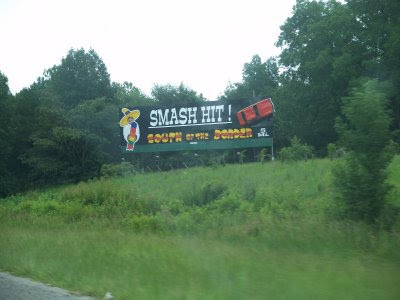 I grew up driving past it and it was the highlight of I 95 travel. BUT, my parents refused to ever stop there - mom made it sound like disease was ievitable - then when I was old enough to stop there on my own I'd been programmed to think that it wasn't the healthy thing to do. Part of me kind of misses that we never go by it any more because of all the new paved roads we have here in SC :) Little known fact: Ben Bernake used to work there. I love roadside Americana. I've always dreamed of having my own roadside attraction. One of my favorites is Wall Drug in South Dakota. Like South of the Border, there are the signs that remind you every 30 miles or so along a 350 mile stretch. Me-Me: You've inspired me to do a Canada's Roadside Attraction post. Hey Canada can do kitsch with the best of them! Mary: Yeah, who knew tacky could be so terrific!